One of the most confounding dilemmas in opera is the question of what to do with scores that were left incomplete by their composers or exist in multiple forms. There are instances in which the decisions are easy, of course: though her earlier guise is not without obvious assets, Beethoven’s Fidelio is almost universally preferred over her younger self, Leonore, and the version of Massenet’s Werther adapted to accommodate a baritone protagonist for the benefit of Mattia Battistini is very rarely heard in comparison with the performance diary of the canonical version with a tenor protagonist. Händel’s Radamisto, Gluck’s Orfeo ed Euridice/Orphée et Eurydice, Offenbach’s Les contes d’Hoffmann, and Verdi’s La forza del destino and Don Carlos all present riddles that are not easily solved. In the nearly 230 years since the opera’s première, conductors, opera house managers, and impresarios have debated whether to perform the Prague or Vienna version of Mozart’s Don Giovanni. Should both of Don Ottavio’s arias be included, or must fidelity to the letter of one of the versions be preserved; and what of Donna Elvira’s ‘Mi tradì quell’alma ingrata’? Is Wagner’s Der fliegende Holländer to be staged in a single act or in three acts, set in Scotland or Norway? Should a performance of Puccini’s Turandot end at the point at which the composer’s death halted his work on the score, employ the sanctioned completion by Franco Alfano, or devise another option? There are as many possible solutions as there are people to ponder the questions, but the very notion of a single right answer is as fanciful as the ‘chimere’ and ‘castelli in aria’ of which Rodolfo sings in La bohème. In a sense, the death of Gaetano Donizetti in 1848 was a merciful release, the last three years of the composer’s life having subjected him to the agonies of disease, deterioration, and institutionalization. Particularly in his final year, bouts of lucidity and work alternated with periods during which it was reported that he had virtually no sensory engagement with his surroundings. Perhaps he retreated in those distant moments into the theatre within him, where new works continued to take shape. The deaths of his parents, his wife, and all three of his children by the autumn of 1837 undoubtedly made his fifth decade a lonely time when the characters to whom he gave life in his scores were his closest companions. Though such projects were rarely without plentiful headaches, the prospect of writing a new score for the Paris Opéra must have at least given Donizetti a welcome outlet into which his energy could be channeled. When the composer abandoned Naples after the censors denied his Poliuto a première on the stage of the Teatro di San Carlo and relocated to Paris in October 1838, he was hardly a stranger in the French capital, where his Anna Bolena, Lucia di Lammermoor, and other scores had attained popularity in the repertories of several theatres, most notably the Théâtre-Italien, performances under the auspices of which—a momentous example being the 1835 première of Donizetti’s Marino Faliero, commissioned by the company and first performed not long after the première of Bellini’s similarly-conceived I puritani—bounced during Donizetti’s residencies in the city among four venues including the famed Salle Favart. After Salvadore Cammarano’s Poliuto underwent redressing by Eugène Scribe as Les martyrs and the resulting opera received its first production at the Opéra in April 1840, Donizetti turned his attention back to fulfilling the second of his two commissions from the Opéra, a setting of a libretto by Scribe and Charles Duveyrier: Le duc d’Albe. By the time that Les martyrs reached the stage, the score of Le duc d’Albe, begun in 1839, was half-completed, vocal lines for the incomplete portions, mostly Acts Three and Four, already substantially sketched. The real impetus for the regrettable ultimate abandonment of Le duc d’Albe will now likely never be known. The oft-repeated story, worthy of Gaston Leroux’s Le fantôme de l’Opéra, of the Opéra’s manager’s dismissal of Le duc d’Albe because its heroine, written with tessitura similar to that of the title rôle in Anna Bolena, was not congenial for the company’s—and his—leading lady, mezzo-soprano Rosine Stoltz, may be wholly or partially apocryphal, but, if not on Stoltz’s behalf surely to her benefit, Hélène in Le duc d’Albe was cast aside in favor of Léonor in La favorite, a reworking of Donizetti’s 1839 score L’ange de Nisida, recently announced as a future Opera Rara recording project. Rather than employing the completion of the score fashioned by Donizetti’s pupil Matteo Salvi and first performed using an Italian translation [Scribe’s libretto did not languish in neglect, eventually being recalled to duty for Verdi’s Les vêpres siciliennes] in Rome in 1882 or exploring other avenues like the jarringly divergent completion by Giorgio Battistelli staged by Vlaamse Opera in 2012, this Opera Rara release presents Roger Parker’s critical edition of only the music completed by Donizetti, augmented by a handful of newly-composed passages, the work of Martin Fitzpatrick, necessary for the continuity of the existing material. True to the label’s mission of ensuring that ‘operas once threatened with extinction [are] now brought vividly back to life,’ this recording enables Twenty-First-Century listeners to hear Le duc d’Albe as it was bequeathed to posterity by its composer in a performance that would have caused the Opéra to reconsider its rejection, Rosine Stoltz and her admirers be damned. Their work having been featured on previous Opera Rara recordings, the excellent playing of the Hallé musicians and the vigorous but stylish conducting of Sir Mark Elder are not surprising, but they here surpass their own high standards. The orchestra’s crackling account of the opera’s atmospheric Prélude launches a performance in which every Hallé member uses his or her instrument not as an impersonal conduit for sound but as a participant in the drama. As in their acclaimed performances and recordings of Wagner’s Die Walküre and Götterdämmerung, the Hallé players excel in the construction of a sonic profile consistent in its brilliance but adaptable in scope to the needs of the score. Donizetti’s skill as an orchestrator became ever more refined as his career progressed, and his writing for strings in Le duc d’Albe has a Mozartean elegance that dovetails very effectively with his bold, Verdian music for brasses and woodwinds. Elder’s ear for individual instrumental timbres and the ways in which Donizetti manages and manipulates them is invaluable in this score, and his trust in his Hallé colleagues’ impeccable musical integrity frees him to focus on presiding over a performance that balances brawn and bel canto. Central to the preservation of that balance is the singing of the Opera Rara Chorus. At the start of Act One, the choristers’ exclamations of ‘Espagne! Espagne! Espagne!’ immediately elevate the temperature of the performance to a feverish level, and the force with which they declaim ‘Honneur à lui! Ce guerrier notre idole’ later in the act is breaktaking. In Act Two, their caroling of ‘Liqueur traîtresse’ introduces wry humor into the otherwise deadly serious circumstances. Then, their ominous ‘Les derniers feux meurent dans l’ombre’ establishes the dangerous tension of the act’s final minutes. The sincere religiosity of their intoning of ‘Liberté! ... Liberté chérie!’ makes Donizetti’s depiction of the Flemings’ quest for freedom from their Hapsburg overlords a relative of the struggles against oppression in Verdi’s Nabucco, I Lombardi alla prima crociata, Attila, and Macbeth. Had Le duc d’Albe been completed, it might well have proved as galvanizing a work of musical politics as Verdi’s Risorgimento operas and Auber’s La muette de Portici. Nevertheless, the most appreciable accomplishment of Elder’s conducting is that nothing about this performance of Le duc d’Albe sounds incomplete. Another expectation of Opera Rara recordings is casting of supporting rôles with artists of markedly higher quality than many opera companies and record labels have sufficient resources or vision to engage. In this regard, too, this Le duc d’Albe is a particular triumph for Opera Rara. Heard in Act One, South African baritone Dawid Kimberg as the Tavernier and Welsh tenor Trystan Llŷr Griffiths as Carlos sing attractively and securely. One of today’s most communicative Lieder singers, Irish tenor Robin Tritschler voices Balbuena’s intoxicated haranguing of Hélène in Act One, ‘Pourquoi dans cette foule heureuse et satisfaite,’ with appropriate swagger, his light but plush voice filling his character’s lines with greater beauty than their coarseness merits. Appearing in both acts, the captain of the Spanish garrison, Sandoval, is portrayed with fittingly martial fortitude by bronze-timbred baritone David Stout, a former head chorister at Westminster Abbey. There is smarmy self-satisfaction in his delivery of ‘Par Saint-Jacques, messieurs, on ne boit qu’à Bruxelles,’ and he chants ‘Voyez donc cette belle’ repulsively—perfectly in character, that is. His mettlesome study of Sandoval continues to gain stature in Act Two. 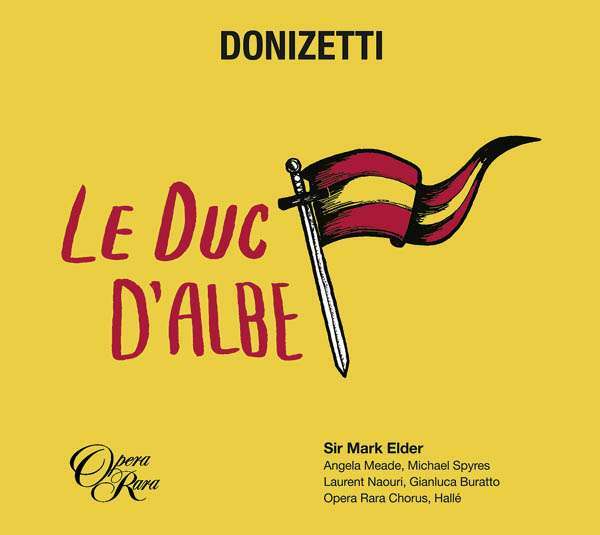 Donizetti deserves no less than Kimberg, Griffiths, Tritschler, and Stout contribute to this Le duc d’Albe, but how many performances or recordings of any repertory enjoy the participation of artists of their calibre? The aptly-named Daniel Brauer is brewed into a potent figure by Italian bass Gianluca Buratto. An uncompromising Flemish patriot, Daniel occasionally seems like a refugee from Meyerbeer’s Less Huguenots, premièred in Paris in 1836. [Incidentally, Scribe also collaborated on the libretto for Les Huguenots.] Buratto detonates ‘Quelle horreur m’environne’ in Act One with dark implications, but he interacts with Hélène with affection and restraint. In the fast-paced second act, the bass takes care to highlight the emotional chasm that opens between ‘Ici l’on travaille et l’on chante!’ and ‘Mais j’entends battre la retraite.’ Buratto’s voice and demeanor are perhaps slightly too refined for the heroic but pragmatic Daniel, but the singer’s performance validates the realization that being a man of action and a man of thought are not mutually-exclusive concepts. Most importantly, he sings Daniel’s music capably and handsomely. The rôle of the enigmatic Duc d’Albe, the Spanish viceroy of Flanders, likely suffers more than any of the other principal characters from the truncated form in which the opera survives, the beginning of Act Three having been planned as a solo scene for the Duc, but French baritone Laurent Naouri takes full advantage of every opportunity given to him and succeeds in creating a remarkably three-dimensional figure whose presence in the drama is considerably greater than the sum of its relatively few musical parts. In Act One, Naouri voices ‘Race faible et poltronne’ powerfully, the character’s ambivalence obvious from the start. The singer’s native French diction is a definite advantage, but the worst French among the cast is very good. The baritone phrases ‘J’aime son audace’ with toughness that does not impede the suggestion of warmth towards his rediscovered son. Absent from Act Two, the Duc’s shadow is perceived nevertheless, largely owing to Naouri’s incendiary portrayal. Along with some splendid high notes, Naouri produces sporadic patches of strenuous, unsteady singing. His reading of the troubled Duc embodies dramatic and musical authority, however, and, solely on vocal terms, he is a legitimate successor to Louis Quilico and Silvano Carroli in the character’s draconian music. The notion that Missouri-born tenor Michael Spyres could sing more excitingly than in his assumption of the rôle of Polyeucte in Opera Rara’s 2014 concert performance and studio recording of Donizetti’s Les martyrs might seem ridiculous to listeners who have not heard this recording of Le duc d’Albe. As the colloquialism promises, though, hearing is believing, and there are sensational things to be heard in Spyres’s singing of Donizetti’s music for Henri de Bruges. In Henri’s exchanges with Hélène, Daniel, and the Duc in Act One, Spyres adopts a lover’s, a fellow patriot’s, and a defiant freedom fighter’s inflections, all while singing magnificently. The tenacity of Spyres’s articulation of ‘Punis mon audace!’—reminiscent of the title character’s ‘Giudici...ad Anna!’ in the Act One finale of Anna Bolena—is thrilling, and his virile ‘Non, non, point de grâce’ transforms the final scene of Act One of Le duc d’Albe from a standard-issue operatic clash into a life-or-death campaign against despotism. His excursions into the vocal stratosphere in the finales of both acts are as invigorating as they are secure. Duetting with his beloved and pursuing his determination to terminate the incumbency of the tyrant who is actually his father, Spyres provides the stimulus that propels Act Two to its electrifying conclusion. In the duet with Hélène, he vocalizes ‘Ah! Oui, longtemps en silence’ with fearlessness and sophistication. These qualities define Spyres’s singing in every scene in which he appears in Le duc d’Albe. The celebrated tenor Gilbert Duprez created the rôles of Polyeucte in Les martyrs and Fernand in La favorite, and it is feasible that it was for Duprez that Donizetti intended the rôle of Henri in Le duc d’Albe. If Duprez was capable of singing Henri’s music half as well as Spyres sings it on this recording, Parisians having been deprived of hearing his interpretation of the part was one of the foremost musical misfortunes of the Nineteenth Century. Spyres’s Henri warrants a first-rate leading lady, and soprano Angela Meade, hailing from Centralia, Washington, and here making her Opera Rara début, fits the bill spectacularly. With a repertoire including lauded outings in rôles as diverse as the Contessa in Mozart’s Le nozze di Figaro, Bellini’s Beatrice di Tenda and Norma, Donizetti’s Anna Bolena and Lucrezia Borgia, Verdi’s Elvira in Ernani, Leonora in Il trovatore, and Alice Ford in Falstaff, and Fidelia in Puccini’s Edgar, Meade is one of today’s most intrepid singers. Vocal dauntlessness is best justified by technical confidence, and Meade’s singing on this recording exudes mastery of red-blooded bel canto. From her first appearance in Act One, she personifies an Hélène whose resilience is nearly as impressive as her vocal resources. Donizetti’s opera essentially enacts upon the stage the events represented in Beethoven’s familiar Egmont Overture, the opera’s plot beginning on the day after Hélène’s father, the Count of Egmont, was executed under orders from the Duke of Alba. With her impassioned singing of ‘Au sein des mers et battu par l’orage,’ Meade confirms that her Hélène is a daughter in whom the spirit of her father lives. The causticity of ‘A quoi bon des prières vaines’ is mirrored in the icy glint that the soprano’s singing takes on, but the lady’s comportment softens with Meade’s lusciously-phrased ‘Ah! Que du ciel descende.’ Then, the aristocratic bearing with which she voices ‘Moi-même je frissonne’ discloses Hélène’s innate nobility of heart. The ease with which Meade rises to the challenges of Act Two is staggering, her utterance of ‘Henri! Noble jeune homme! Ah, j’ai lu dans son âme’ amazing with its blend of technical aptitude and histrionic panache. Equally gripping is her expressive ‘Ton ombre murmure, o mon père!’ In the duet with Henri, she sculpts the line in ‘Oui, longtemps en silence’ with the unerring hand of a Rodin, capturing in sound the souls of both the text and the woman she portrays. Meade’s jaunts above the stave are fantastic, not least the extraordinary top E♭ in unison with Spyres in Act Two, but it is the solidity of the sound throughout the wide compass of her music that is so gratifying. With her performance in Le duc d’Albe, Meade affirms that in her Opera Rara’s discerning decision makers have found a prima donna who earns a place alongside Nelly Miricioiu, Majella Cullagh, and Annick Massis. Opera Rara’s commitment to recording ignored treasures of Nineteenth-Century opera—or, as in the case of the label’s planned studio recording of Rossini’s Semiramide, recording these treasures as they ought to be but are so rarely performed—sometimes leads into musical territory that Alexander Pope might have described as ground ‘where angels fear to tread,’ but no fools rushing in are Opera Rara and the artists who take part in the label’s projects! The Opera Rara catalogue is a lavish collection of performances that allow scores to exhibit their efficacy as their composers intended, but even among many gems this Le duc d’Albe sparkles very brightly.